Since 1996, Innovative Tools & Technologies has dedicated its resources to helping customers be more efficient, productive, and profitable, with its uniquely designed and virtually indestructible work and parts management systems. The company evolved out of necessity. Founder Bryan Johnson, an auto body technician for more than 21 years, was literally over a barrel, as was the rest of the auto body repair and collision services industry. At that time, plastic bumper covers were placed over trash barrels for painting, baking, and curing, and the end result was often “trash” resulting in uneven paint coverage, unpredictable texture, and distorted shape; not to mention the tedious set-up process. There had to be a better way to support and secure bumpers during the repair and paint process, and Bryan created it: the SuperStand. Not only did the SuperStand take bumper quality to the next level, it saved at least half an hour of labor per bumper, paying for itself in less than a month. Bryan’s colleagues saw the system and had to have it. Word about the super-star bumper stand spread and other shops had to have it, too. Soon, Bryan quit his day job in order to meet demand and develop other products to solve customer workflow and parts management challenges. Word spread further about the company’s workhorse products, and Innovative Tools entered the aviation, material handling, and home markets with the promise of enhanced productivity and quality output at a fair price. 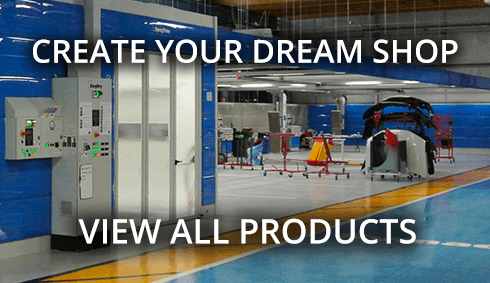 Innovative Tools' customers have learned that the company offers the best-designed, highest-quality products at the best price – all backed by the industry’s best warranty. The benefits? Increased productivity, quality throughout, and profitability. Not to mention less clutter, and fewer lost parts and tempers. Innovative Tools & Technologies earns its business by making its customers’ work and parts management processes more efficient and more profitable by walking the walk and sticking to its core values. Apply Innovative design to solve customer problems, improve productivity. Innovative Tools invented the work and parts management systems segment of the collision services and automotive repair industry with its one-of-a-kind, ingenious solutions to customer problems. Others have attempted to replicate its products, but Innovative customers know the difference and pass the word along. The industry’s best, three-year warranty – although it’s never been utilized! "Innovative has a flat, open leadership structure where each team member picks up the phone, listens to customers, and builds personal relationships. Managers are empowered to go beyond their normal job boundaries to act as company ambassadors, business and market development specialists, and customer advocates. They know the company and its products inside and out, and take the initiative to support customers – often beyond the scope of Innovative’s products and services."